Target-seeking scenarios (also known as ‘normative scenarios’) constitute one subclass of the more general class of intervention scenarios (also known as ‘policy scenarios’) and can contribute significantly to policy design and implementation. They are a valuable tool for examining the viability and effectiveness of alternative pathways to a desired outcome. They start with the definition of a clear objective or a set of objectives that can either be specified in terms of achievable targets (e.g. in terms of the extent of natural habitats remaining, or of food production self-sufficiency) or as an objective function to be optimised (e.g. minimal biodiversity loss). 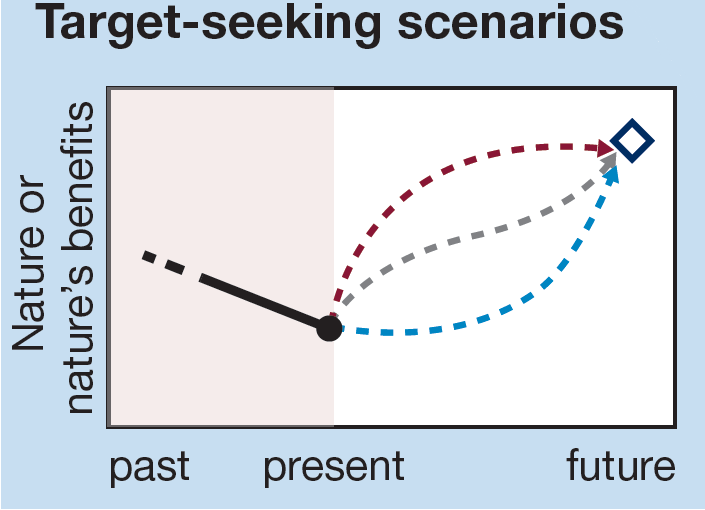 Figure SPM 2: Target-seeking scenarios illustrated by a graph of changes in nature and nature’s benefits over time. The diamond represents an agreed-upon future target and the coloured dashed lines indicate scenarios that provide alternative pathways for reaching this target. Table 3.1: Combining scenario approaches and policy objectives (in the context of target-seeking scenarios).